It appears that another celebrity death hoax is rapidly spreading on Facebook – Vanilla Ice is the latest subject, and this isn’t the first time. 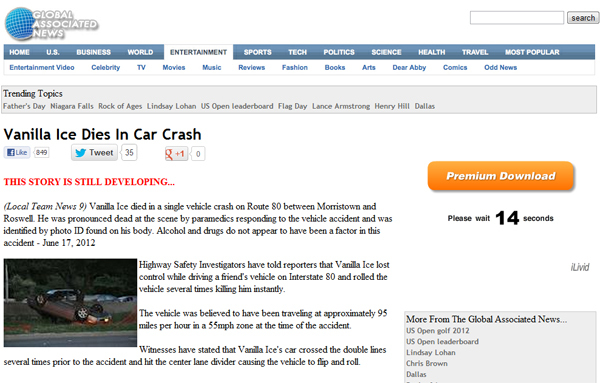 Clicking the wall post takes you to http://vanilla.ice.swellserver.com/news/top_stories/auto80.php – a rather odd looking url for a news site. Also, none of the news category links are active either. The only working links are ones to other bogus stories. Usually hoaxes like this are created to drive traffic to advertising sites, generate Adsense revenue or some other monetary incentive. Always take a moment to check the facts before spreading messages and warnings on Facebook. It might save you some embarassment from your friends. We double checked in Google and other mainstream news sites, and there is no mention of the incident. You can rest assured that if this was indeed a true story, then every major news network would be covering it. If you or your Facebook friends are falling for tricks like this, it’s time to get yourself informed of the latest threats. Be sure to join the Facecrooks community of 162,000 fans on Facebook to be kept informed of the latest security issues. Do Not Track + is a FREE browser plugin created by Abine. This easy to install plugin keeps websites from tracking you. If you value your online privacy, then you should definitely take advantage of this free product.